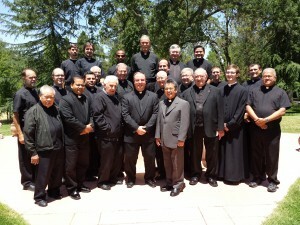 The Oblates of St. Joseph of the Holy Spouses Province in the United States. We started the work on our communications immediately after the official unification of the Oblates of St. Joseph this past March. Since then we have been evaluating how we can best share our spirituality and mission with the people we serve, how we can facilitate communication with all those interested in our work, and how we can present Jesus to the world in imitation of St. Joseph. While a website alone can never do this, we realized right from the start how important it would be for us to renew our web presence as a new Province, and thus began our work on the all new osjusa.org. With the launch of our new website, we will simultaneously begin to redirect visitors from our old sites of osjoseph.org, oblates-stjoseph.com, and imitateJoseph.org. We have migrated nearly all of the content from these sites and merged it together in a new format and presentation that tries to captures the timeless spirit of the Church with the modern presentation of the technological world we live in. An updated library of theological studies of St. Joseph, include scriptural studies, magisterial documents, historical perspectives. and a growing collection of prayers, hymns and devotions to St. Joseph. An ever expanding St. Joseph in Art section that is easier than ever to explore the vast array of artwork related to St. Joseph. A comprehensive section on vocations for those pondering a call to be an Oblate of St. Joseph. The largest collection of material about our founder St. Joseph Marello that you can find on the web, including biographies and prayers. A complete directory and contact system for finding houses and Oblates around our Province and around the world. We have started to create pages for all of our SLIM chapters and we will be working with local representatives to bring you the local news and materials for our lay friends around the country. In the coming weeks and months we will be adding the complete collection of the critical edition of Marello’s letters. You can see that we have already started adding his letters in a format that is much easier to browse and search than we have ever done before. Finally, we will eventually be running the site in both English and Spanish in order to best serve the people of our communities. We are grateful to God for the unification of Oblates throughout the country. As this website serves Oblates and Oblate friends throughout the country, we ask you to continue to pray for us as we do for you, that our efforts to share the gospel with all people might bear great fruit for the Church! Father Matthew this is a job well done!!! Everything in one place. Current. Easy to navigate. Awesome!! Grazie per tuo padre e apostalico lavoro dedicasion; apresiamos QUI nella nostra famiglia tanto e sempre pregano per voi .. Dio vi benedica. Thank you for updating the site and we look forward to accessing it. I just happened to be in one of your Churches in Hazleton PA and was curious about your Order. Excellent job on the website. Very well organized, informative, aesthetically pleasing, etc. etc. I love the integration of beautiful sacred art. One of the better religious order websites I’ve been on. May God bless your Order and may it continue to grow through the prayers of Ss. Joseph and Mary. Was hoping to be able to donate online as forgot to send end of year donation by check. Disappointed couldn’t do so, but will send donation by mail. Are you considering online donations in the future? Sorry Guardian of the Redeemer mag has come to an end. Fr. Larry, thanks for a beautiful publication.